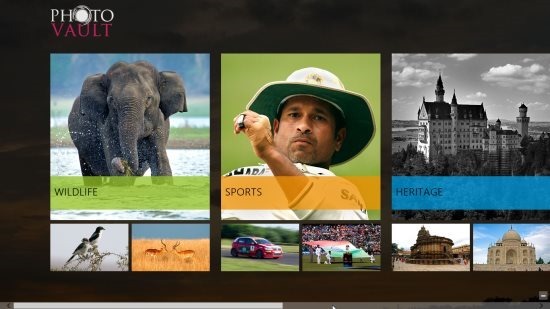 Photo Vault App is a free photo app for Windows 8 that contains just the pictures of various categories such as wildlife, Sports, Heritage, People & Places, and more. Each category has been further divided into different regions. For example– If you click on People & Places, it will show a dropdown arrow from where you can choose as to which region do you want to view pictures of. Offers different categories of viewing beautiful pictures. Offers description along with a photo. You can view photos region wise. Windows 8 Photo Vault app has been grouped into six different categories. With a click on any one from these categories, you can view the amazing bundle of pictures. Under Wildlife category, you can view the pictures of different wild animals. Sports category brings you amazing pictures related to sports and games. And same with other given categories. The best part of this app for Windows 8 is that it gives a brief description about each photo. You can also check out our post on Windows 8 Books app. Photo Vault App is a good app for those who are fond of watching amazing pictures. Go ahead and try this app for Windows 8, given under the Spotlight category in Windows 8 App Store.